With advancing age, every individual can be affected by sensory, motor, and cognitive defects, as well as by chronic illnesses. Past the age of 85 years, over three out of four French people state that their activities are limited. Falls, which are frequent events for older people, are part of the risk of losing autonomy and being admitted to an institution, and prove very costly in terms of quality of life and care. In an ageing population, prevention of falls and maintaining independence in daily activities are therefore major challenges for public health. The authors of the collective expert report thus emphasise the beneficial effect of regular physical activity, centred on balance training, for all older subjects at varying risk of falling. 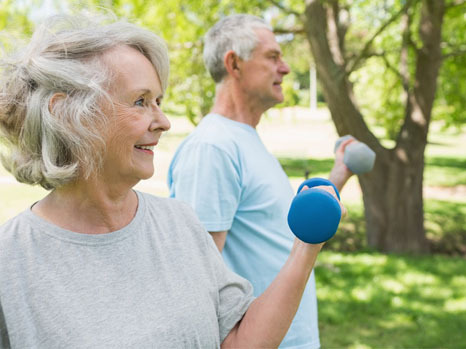 To be tailored to the state of health and lifestyle of older people, physical exercise programmes should be better supervised and involve closer cooperation between players from the medical, non-profit and sports sectors. The elderly population is a very heterogeneous group from a medical and functional point of view. From the age of 65 years, 15-20% of people living at home would be fragile. Moreover, fragility is associated with an increased risk of mortality and insults such as falls. In France, according to the permanent survey on everyday accidents, falls represented 90% of everyday accidents recorded among the over 75s by the emergency services in 2009. 20-33% of people aged 65 years or older report having fallen in the previous year. Of those who had fallen, half would have fallen at least twice that year. Moreover, falls are the main cause of physical trauma among the over 70s. The most effective exercise programmes are those centred on balance training. Generally, those that include balance exercises lead to a significant reduction in risk of falling in the order of 25%. Nonetheless, muscle strength training and endurance improvement contribute to the maintenance of functional abilities, and have effects that complement balance training in preventing falls. For older people living at home, programmes based on several types of physical activity exercises are effective in both reducing the rate of falls, the risk of falling, and the risk of fractures. Older people who devote time to a physical activity have a better perception of their general health, vitality, and mental and physical condition. – Educate people about falls, and identify and care for older people at risk. – Better define the facilitators and impediments to participation in physical activity by older people. La coordination de cette expertise a été assurée par le Pôle d’expertise collective de l’Inserm rattaché à l’Institut multi-organismes Santé publique.